This November marks numerous anniversaries, with varying levels of significance. Perhaps the best known is that this month is the twentieth anniversary of the Ultimate Fighting Championship: UFC 1 was held on the 12th November 1993. A lesser known anniversary is that in the same month Royce stepped into the Octagon, BJJ was first taught in Europe, thanks to BJJ and MMA pioneer Remco Pardoel. He brought Romero 'Jacare' Cavalcanti to the Netherlands in November 1993, shortly before that first UFC and well before the vast majority of people in Europe had even heard of BJJ (which is why Remco remains high on my list of people I'd love to interview). Remco went on to fight Royce in UFC 2, followed by a spot at the first Mundials in 1996. On a personal note, as of yesterday it is seven years since I took my first official class of Brazilian jiu jitsu, taught by Felipe Souza at the Roger Gracie Academy. November 2012 was the first time I flew to the United States. 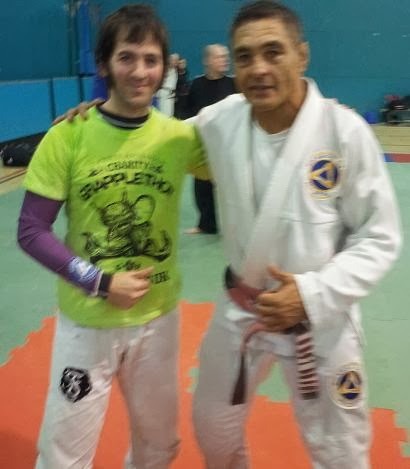 Today, I've got a new November anniversary to add to that list: November will now also mark when I trained with Rickson Gracie (shame about the picture quality: the guy who took it must have hit the wrong button on my phone). When I previously went to Scotland, it was as part of a short holiday in Galloway: that involved an extended car journey spread across two days. A much quicker option is to fly, so I booked a £78 flight from Bristol. It meant for a long day, getting up at 05:30 and returning home at 23:40, but I thought it was worth it for the experience. I certainly wasn't the only one, as when I arrived at the sports centre, there were over a hundred people in attendance. That included several black belts, such as the UK trailblazer, Rick Young (who would also be a fascinating interviewee). Thanks to Scott McVeigh, the organiser of the seminar who had very kindly given me a heads up before he released the date to the public, I was able to speak briefly with Rickson before the seminar started (that interview can be found in issue #18 of Jiu Jitsu Style Magazine, available here). I met Scott last year and he has stayed in touch, inviting me to multiple seminars since then. I was pleased I could finally take him up on the suggestion today. At £95 it is the most expensive seminar I've attended to date, but you have to expect that with a name as big as Rickson. The man himself warmed up on a Swiss ball in the centre of the mats, exhaling forcefully in what I assume was a specific breathing exercise. At various points he stopped, stood up, then walked over to shake hands with a section of the group, making a point of greeting everybody on the mats. His three hour seminar began with the technique he'd been practicing in full view up until he officially kicked things off: how to breathe. Probably the most famous scene in the seminal documentary Choke is when Rickson demonstrates his impressive diaphragm and breathing control. We were treated to a live performance, as Rickson pulled off his shirt so he could emphasise the correct way to breathe. His main point was that you should use the whole of the lungs, rather than just the narrow opening at the top. Most of us do the latter, breathing with our chest. Rickson advises using the diaphragm instead. To practice, lie down on your back, with a hand on your chest and the other on your stomach. When you breathe, your chest should not move, just your diaphragm. Also key is exhaling when you're tired, rather than desperately gasping for breath. Rickson said that you need to expel what he called "bad breath", in order to leave room for "good breath," as if you were a bottle of dirty water that needs to be emptied before it can be refilled with clean liquid. Just like Michel Verhoeven's seminar a little while ago, Rickson then covered how to create a 'connection' with your opponent from the standing position. It isn't enough to have base: you also need to generate that connection. This was definitely the most 'invisible' part of the invisible jiu jitsu shown today, a number of people struggling to apply it as a result. The idea is that when the other person pulls or pushes, you stay put due to this connection. It's based around your hip and leg posture, as far as I could tell, sinking your hips and sticking your bum out slightly, keeping your legs apart on the top right and bottom left corner of a square. However, I say that as somebody who struggled with this one too. Adding to that was the same connection from a different position, where your arms are wrapped around their waist. This again was difficult to understand, but the 'connection' this time seemed to involve driving the point of your shoulder into their side, rather than relying on your arms. Finally, there was yet another stand-up connection, when you're trying to move in for a takedown. Rickson went through an exercise where you're grabbing their collar, pushing into their chest, then mirroring them with your feet as they move. It was much easier to understand the two side control escapes Rickson taught us next. Both are mechanically quite simple, functional against the orthodox side control position where they have one arm under your head, the other by your far arm (as per that picture of Xande). Instead of the usual frame against their neck, your arm clamps on top of theirs, reaching for your legs. This is your point of connection. Swing your legs up and then across, towards their hips. That should generate the momentum to turn so you're facing them, freeing your shoulder and pulling yourself onto your side. Use your outside foot for base as you shrimp back, where you can then either turn to your knees or look to recover guard. Maintain that connection of your outside foot to the floor, dragging your other leg out as you slide backwards. The second option is for countering the cross-face. If they are driving hard into your face with their shoulder, the first escape variation will be difficult. So instead, you're going to move the arm that would be normally be against their hip (in an orthodox side control defensive frame). Reach underneath them, towards your same side hip. Using the shoulder of that arm, bump them with some quick bridging motions. You're looking to knock them over your head, giving you the space to then swivel free past their arm, potentially even getting some control of their arm in the process. As ever in jiu jitsu techniques work best in combination: when they relax their cross-face to deal with this second escape attempt, it's the perfect time to switch back to the first variation. Rickson followed up with some drilling of the side control top position, emphasising that you should aim to cross the line of their sternum with your own. He had us drill that without using our arms (I saw something comparable in Andre Galvao's book, which I turned into a drill I often teach in my own classes). The topic moved on to the armbar from guard. Once you have control of their arm, rather than climbing for the armbar gradually, stepping off the hip, Rickson advocates jumping your legs up onto their shoulders right away. He feels that the slower approach, where you push off their hip to get your legs up there, gives your opponent time to stack and escape. I wasn't sure where you were basing for Rickson's shortcut, but when drilling it felt like I was pushing off my own shoulders as I flung my legs to wrap up high on their body. The advantage of this method is that once you have the arm and spring to that position, they don't have much of a chance to resist: it's like you've skipped a step of the armbar set-up. You aren't scrunched up at any point, because you've gone straight to that stretched out position. Once you've got your legs by their shoulders, keeping your knees tightly clamped and calves gripping their back, you just have to bring your leg over their head to lock it in. Similarly, Rickson advised that if they stand, you need to become adept at walking your legs up their back, 'biting' in as you move, until you reach the shoulders and can again lock in that armbar. Update August 2016: I've since had a chance to teach this myself, having learned a slightly different variation from another BJJ legend, Chris Haueter. Sticking with offence from the guard, Rickson transitioned into taking the back, where the scenario is that you've already knocked them to the side and the route to their back is available. As with his perspective on the armbar, Rickson feels that the typical crawling around the back involves too much effort. He instead prefers to wrap one arm around the back, securing you in place pressed against their shoulder. The difference comes with the legs. He locks those low on their back, then stretches his limbs out. You can use the lower leg (which will be across their stomach) to chop into their far knee, a bit like a scissor sweep. That should hopefully put them on their belly, making it easier for you to shimmy round and establish the back position. Rickson then took a leaf out of Marcelo Garcia's Advanced Brazilian Jiu Jitsu, in that he also highlighted the importance of the seat belt grip when taking the back. Just like Marcelo, Rickson showed how if you have that seatbelt, you can maintain the back even without having your hooks in place. If your opponent is in the turtle, apply the seat belt. Be sure to lock it into their chest, not their head: with the latter, they can pop their head free. From there, you can leap over and roll them into place, ready to insert your hooks. You can also do what Marcelo demonstrates, crawling behind them to force a seated position, where again you have a good opportunity to insert your hooks. You can then follow up with Rickson's suggested submission, the rear naked choke. Rickson's concept here reminded me a bit of Saulo's defence. Saulo likes the have one thumb in the opposite collar, while his other hand stays mobile, blocking any attacks. Rickson does something similar with his offence. He works his choking hand in, digging past the jawline, then uses his other hand in an almost defensive way, stripping their grips and preventing them from blocking his choking arm. Once it is in place, he can finish the choke. As Demian Maia shows, you can complete the choke without getting your second arm behind their head, or even with just the one arm. There weren't any breaks, meaning I don't think I quite caught the final two techniques. I concentrated on getting the earlier material in my head, as that interested me more. Nevertheless, from what I remember there was a discussion of vale tudo guard, something which Rickson feels has been increasingly lacking in modern MMA. This revolves around getting your shin across their stomach to control the distance, whacking into their side with your other heel. The three hours finished up with a guillotine Rickson apparently learned from Kron. It's cool that his jiu jitsu is still evolving after all this time, though I have to admit I did not get good notes on this one. From what I can recall, it was applied with the palm down rather than up, but I may well be misremembering. Rickson's teaching style doesn't spend too long going through the details. He'll run through the techniques a couple of times, then have everyone drill it for a few minutes before moving on. Although it did not feel like he was spending much time on explaining, his words were efficient, as aside from the vale tudo guard and guillotine, I didn't have any trouble recollecting the key points Rickson had made. He also encouraged everybody to ask questions, both in drilling and immediately after he finished demonstrating. Generally he would answer questions by inviting the person who asked to drill it with him in front of everyone else, making sure they understood. Rickson did not stick with one uke either, rotating regularly by randomly picking people standing nearby. The pattern tended to be having them try their typical approach, he would show his variation, then he would get them to attempt it again, correcting as necessary. Rickson is obviously well practiced at being a celebrity. He signed books and then posed for pictures with anyone who asked, resulting in a large huddle around him with people waving their phones (myself included). There was plenty of Rickson merchandise for sale, mainly t-shirts, gi patches, tank tops and baseball caps, emblazoned with the old Rickson Gracie Association logo. I think there were a few gis on offer too (though I'm not sure if they were the classic Mizuno gis I've heard used to be a staple at Rickson's schools). In the weeks leading up to November, I had arranged to speak at greater length with Rickson after the seminar, for the JJS interview. Unfortunately that didn't work out: I guess Rickson was busy or simply tired (he had sounded under the weather), as he went straight back to the hotel instead. I think he will be over again next year, though I'm not sure when. Heading over to the Netherlands and training with Michel Verhoeven would be a great option as well: comparing the two seminars, I feel confident that you would not be disappointed if you went to Verhoeven's class hoping to learn Rickson's jiu jitsu. Nice review! I've been to three Rickson seminars and still have trouble putting the concepts into words.! Thanks! Yeah, I was curious beforehand how difficult it would be to write-up, given that so many people have said you have to feel his jiu jitsu, it can't be described. I can see their point regarding the stand-up side of things, but the rest of the techniques were rather less esoteric. Though that depends what he has taught in other seminars: listening to him afterwards speaking about his plans for the next one, I get the impression that he was keeping the level quite basic for this one. Thanks for the write up! I haven't had the chance to attend a Rickson seminar yet so I am always interested in to hear others reports. On the armbar, did Rickson teach it where you move your body to the side, or stay squared up with your opponent? Hmm. I think he stayed relatively square, but I have to admit I wasn't concentrating on that part. The main element that stuck in my mind was that shortcut, going straight to legs on the shoulders rather than stepping off their hip. Thanks for the reply! One more question if I may. In the second side mount escape, what was the swiveling motion like? Legs bent moving side to side? Legs in the air moving side to side? Legs swinging low, hovering the ground side to side? The second side control escape (countering the cross face) was more about the shoulder than the legs, wriggling underneath them, a few quick bridges, then popping your head out as you turn to your knees. It seems to me that Rickson's stuff has evolved a bit in the last couple years. In one seminar write up, the author described a similar side mount escape to the first one you did. However, in this instance you put your arm over their back on the far side of the head, using your armpit on their shoulder as the connection point. I've tried this technique but always thought it exposed my arm too much to attacks. I will have to try this way you described because it seems like it would be safer. Closest thing I've seen to it is the escape Demian Maia does on his first DVD, but he puts his arm against their head rather than relying so much on the turning momentum. I feel a bit vulnerable not having my forearm into their neck, but I'm looking forward to trying out those two escape options.